I became a prisoner of war in Germany on Nov. 2, 1944, when my B-17 was shot down in the vicinity of Merseburg after bombing the Leuna oil refinery. I was a navigator, a 2nd Lieutenant flying that day with Lt. O.J. Snow's crew. It was my 17th-and last-bombing mission over Germany. 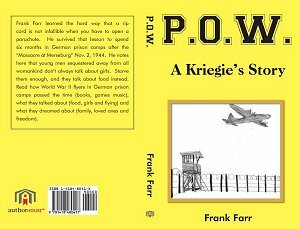 After interrogation at Oberursel and a week of "rehabilitation" at Wetzlar, I was sent to the Belaria compound of Stalag Luft III near Sagan. I spent two relatively comfortable months there. Then early in January, with the Russians moving west toward Germany, we were ordered to set out for Moosburg and Stalag VII A, though we didn't know our destination at that time. We marched for five days, a long, dirty, ragged column of prisoners before being loaded into box cars and transported to Stalag VII A. The relative comfort we had enjoyed at Belaria was not to be at Moosburg. We were crowded in barracks-like buildings, assigned three-tiered bunks set no more than three or four feet apart. In the four months I spent in Stalag VII A, I read 54 books. Though we had very few comforts, we did have a library. I was never mistreated in Germany, but I got very hungry. I weighed a healthy 135 pounds when I was shot down, and about 115 when General George Patton's Third Army liberated us on April 29, 1945. Possibly the two most vivid memories I have of Moosburg were these two events: Our main meal of the day came at mid-day. It was a large bowl of soup, either semolina or barley, I think. On lucky days, we found a bite or two of horsemeat in the soup. One day, I had all the soup I wanted because the servers found in the bottom of the soup bucket, a long, furry rat that had evidently fallen into the vat in which the soup was prepared. Since I had a strong stomach, I ate my own soup and that of two other prisoners who could not bring themselves to eat it. The other bright memory is that of a warm sunny day in early spring when we sat in the sun on the ground de-fleaing our straw mattresses. I must have flipped hundreds of fleas off my mattress, but that night they were back in undiminished numbers playing leapfrog on my stomach. After our liberation, we remained prisoners - this time of the Americans - for nearly two more weeks while plans were made and carried out to move us to holding stations in France. We were not permitted to leave the compound, probably for our own protection. Authorities were probably trying to keep us safe from our own foolishness and, perhaps, to afford a measure of protection to the German population around us. However, one day I decided to go out and look around. An armed American guard at the gate said, "I'm sorry, Lieutenant; my orders are to prevent you from leaving the camp. But," he added, "there's a hole in the fence down there a couple of hundred yards that I can't see." I thanked him and went through the hole in the fence. I walked through the woods reveling in the beauty of the forest in early spring, listening to the birds. I crossed the Isar River on a ruined bridge, hopping from one segment to another, and walked to Landshut. The feeling of freedom after six months of incarceration was wonderful! Last update 30.12.2004 by © WebTeam Moosburg - All rights reserved!